I really enjoyed Quentin Tarantino’s The Hateful Eight, but I’m not sure that’s a good thing. The film, presented in glorious Panavision 70 on one of the broadest screens available, is a work of morbid beauty. Tarantino’s use of specially rebuilt cameras may be a gimmick, but it is an extremely effective one, revealing rich detail in the heightened reality of The Hateful Eight. This is especially true of the unfortunately rare exterior shots, but the extra image space is put to good use in Minnie’s where most of the film is set as well. The titular eight are trapped in this roadhouse by a blizzard. Over the course of the film their motivations and allegiances are slowly revealed and tested. 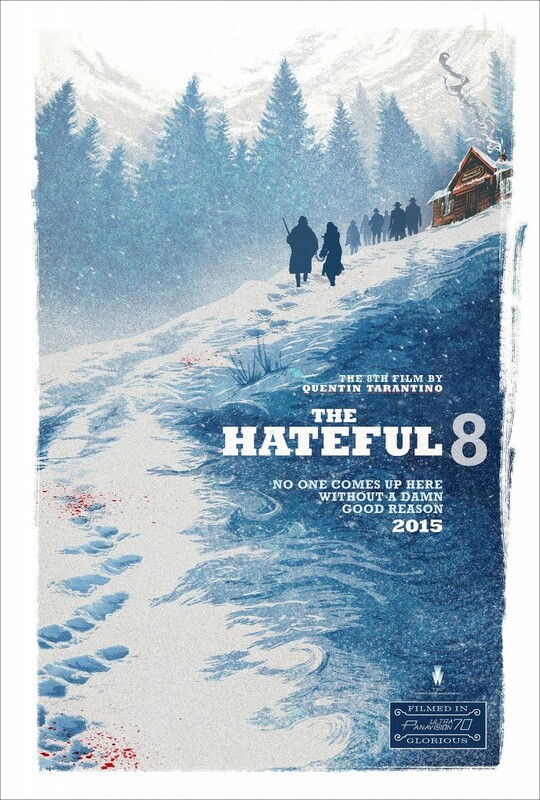 That things will not end well is indicated by the title card: “The eighth film by Quentin Tarantino.” Like so many of his previous films, the blood spilled in The Hateful Eight is best measured in gallons. In one of the many monologues in The Hateful Eight, Oswaldo Mobray (Tim Roth), who identifies himself as the hangman of the area, ruminates on the difference between civilized justice and frontier justice. The hangman, he says, makes all the difference between the two, since the hangman is dispassionate, simply doing his job. Frontier justice, on the other hand, is perpetrated by extremely passionate parties motivated by revenge. Mobray ends his speech commenting that frontier justice may be more satisfying, but it is not justice. Though four of the men in the room claim to be agents of the so-called civilized justice system, the truth of their claims is in question from the beginning. Even if these men are taken at their word, the justness of their justice is suspect. Early in the film Warren says his preferred method of capturing his bounties is to shoot them in the back from a distance and bring their bodies in to collect the reward. While Ruth prefers to bring his bounties in alive, his treatment of his prisoners leaves much to be desired. Every death in The Hateful Eight, whether perpetrated by officers of civilized justice or not is frontier justice. In some cases the deceased have, for years, escaped justice for their sins, and not many would shed tears over their deaths. However, their deaths come by another’s hatred, not her or his desire for proper justice. Oswaldo proves to be correct in his assessment of frontier justice. Watching this lesser justice play out is incredibly satisfying, particularly as directed by Quentin Tarantino. At some point however, the excessive gore shifts from satisfying to unsettling. This point varies viewer to viewer, and may be non-existent for some, as evidenced by the way some members of my audience reacted to certain acts of violence during our screening of the film. I suspect that Tarantino intended to make the audience uncomfortable with the level of violence in the film. I’m not entirely sure he pulled this off particularly well. While the images of violence are abhorrent, and Tarantino’s frequently hilarious dialogue often succeeds in justifying the dubious righteousness of the violence depicted on screen. This tonal dissonance is what makes me uncomfortable with my enjoyment of the film. Whether or not the director’s intent lines up with viewer response, The Hateful Eight was effective in making me think. At the beginning of the film, after a few establishing shots of the landscape, the first image we see is a snow-covered crucifix which stays on screen for several minutes during the opening credits. Christ’s sacrificial example stands in stark contrast to the hateful characters of the film. In particular, the crucifix suggests to me what Paul would later write in Romans, “Don’t try to get revenge for yourselves, my dear friends, but leave room for God’s wrath” (Rom 12:19a). When faced with injustice, Christ surrendered to misplaced frontier justice, allowing room for God’s wrath. The Hateful Eight spells out the consequences of failing to live up to this command in graphic detail. Vengeance heaps on vengeance until the final, grisly scene more closely resembles a horror film than a western. From the right perspective, Jesus’ death might also be considered a grisly horror scene. That Christians are called to follow Christ’s example in this regard is unsettling. Perhaps this is why frontier justice is so appealing.